From 2013 to 2018, Veterinary Team Brief delivered tools and solutions for the veterinary practice. You are viewing content from the Veterinary Team Brief archive. Click here to learn more. Jacqueline M. Parr, DVM, MSc, DACVN, aka The Kibble Queen, is a board-certified veterinary clinical nutritionist. During her internship, she received the Dr. Sharon Drellich Memorial Award for professionalism, collegiality, and compassion. She also received the Ontario Veterinary College Young Alumnus Award in 2016. Her passions are teaching and social media. She blogs for Dr. Andy Roark through her personal company On Parr Nutrition and has lectured frequently at conferences and veterinary schools across Canada. FUN FACT: Jacqueline enjoys watching hockey, working out, and spending time with her beloved dogs. The Association of American Feed Control Officials (AAFCO) consists of voluntary members from local, state, and federal agencies responsible for regulating the sale and distribution of animal feeds and drugs. Members include regulatory officials from the United States, Canada, and Costa Rica. The AAFCO provides a forum for its members to develop laws that safeguard animal and human health and standardize manufacturing and labeling practices.1 Test your knowledge about the correct terms and rules about pet food with these questions. 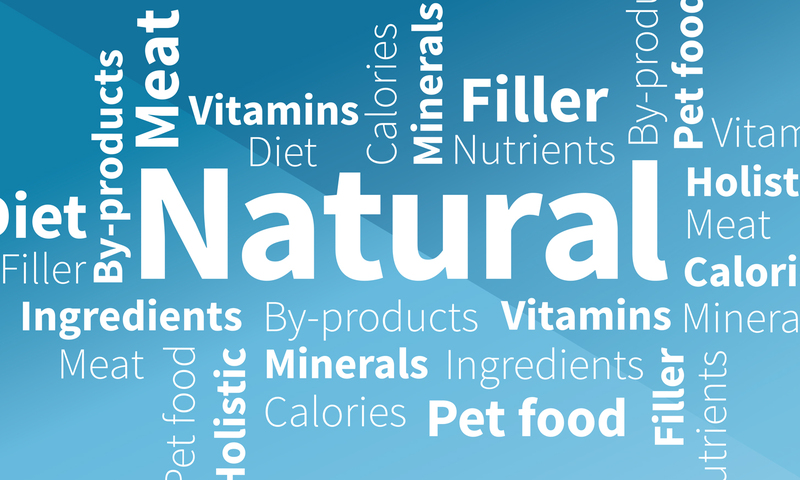 Many pet foods for dogs and cats are labeled natural, but a clients perception of natural may be different from the AAFCOs definition.2,3 Which of the following statements about ingredients is not included in the AAFCOs definition of a natural pet food? They can be derived from various sources: plant (eg, soy, barley), animal (eg, chicken, beef), mineral (eg, salt). They can be processed in different ways (eg, cooking, grinding, hydrolyzing [ie, breaking down whole proteins into smaller protein fragments]). They must be high-quality and nutritious. They can include synthetic amino acids (eg, taurine, methionine) if the product packaging clearly states the product is natural with added vitamins, minerals, and other trace nutrients. They cannot include added vitamins, minerals, or other trace nutrients if the packaging clearly states that the product is 100-percent natural or all-natural. The term natural refers only to the source of ingredients used to make pet food; it does not refer to the quality of the ingredients or the nutrients they provide.2 For example, most crushed chicken bones provide only minerals, whereas a combination of chicken muscle, chicken skin, chicken bones, and chicken organs provides proteins, fats, vitamins, and minerals. Both ingredients are considered natural. If a products packaging states that it is 100-percent all-natural or all-natural, it cannot then state with added vitamins, minerals, or other trace nutrients because those ingredients are synthetic. Which of the following statements is true regarding the term holistic when used to describe pet food for dogs and cats? The diet is complete and balanced for the species indicated. The diet contains only natural ingredients. The pet food industry uses the term for marketing purposes only. The AAFCO defines the term in their official publication. The diet is high-quality and highly digestible. By-products from a number of meat sources (eg, beef, pork, chicken) can be included in pet food. By-products provide amino acids, fatty acids, vitamins, and minerals. According to the AAFCO, which of the following beef by-products cannot be included in pet food? According to the AAFCO, beef by-product does not include hair, horns, teeth, and hooves.5 Additionally, the GI tract must not contain contents or manure (ie, feces), according to the AAFCO definition.5 Acceptable beef by-products are the clean parts, other than meat, derived from slaughtered [cattle].5 These include bones, kidneys, livers, and lungs. Which of the following ingredients is considered filler in pet food? AAFCO has not defined the term filler, nor has any regulatory body in the United States.4 Filler, however, might be defined as a pet food ingredient that provides no nutritional value to the animal consuming the diet. Food coloring makes pet food appear more appealing to clients, but it does not provide any nutrients to the pet. Beef by-products, corn gluten meal, cornstarch, and meat and bone meal all provide nutrients. When selecting a pet food for an animal at a specific life stage (eg, growth, adult maintenance), which of the following on the packaging can the client consider to help determine if all essential nutrients (eg, amino acids, fatty acids, vitamins, minerals) are being provided? The calorie content (ie, metabolizable energy) simply states how many calories are provided per unit (eg, kcal/cup, kcal/can) and per kilogram of food (ie, kcal/kg).7 Information is not provided on the specific nutrients in the pet food. The guaranteed analysis includes, in order, the minimum percentage of crude protein and crude fat and the maximum percentage of crude fiber and moisture.8 These minimum and maximum values provide approximate values only. A full nutrient profile (ie, typical analysis) with average concentrations of each nutrient indicates whether all essential nutrients are being provided. The ingredient list shows the individual ingredients included in the pet food, but it does not list the nutrients provided by those ingredients. Contacting the manufacturer can always be helpful for getting a full nutrient profile (ie, typical analysis) with average concentrations of each nutrient. A full nutrient profile allows a veterinary clinical nutritionist to determine if all essential nutrients are being provided. Directions need to state only the amount of product to be fed based on the pets body weight. Information is not provided on the specific nutrients in the pet food. Welcome to AAFCO. Association of American Feed Control Officials. http://www.aafco.org. Accessed December 15, 2017. Feed terms and ingredient definitions. In: The Association of American Feed Control Officials (AAFCO) 2017 Official Publication. Champaign, IL: 2017:350. Model bill and regulations. In: The Association of American Feed Control Officials (AAFCO) 2017 Official Publication. Champaign, IL: 2017:148. Carter RA, Bauer JE, Kersey JH, Buff PR. Awareness and evaluation of natural pet food products in the United States. J Am Vet Med Assoc. 2014;245(11):1241-1248. Feed terms and ingredient definitions. In: The Association of American Feed Control Officials (AAFCO) 2017 Official Publication. Champaign, IL: 2017:359. Model bill and regulations. In: The Association of American Feed Control Officials (AAFCO) 2017 Official Publication. Champaign, IL: 2017:142-144. Model bill and regulations. In: The Association of American Feed Control Officials (AAFCO) 2017 Official Publication. Champaign, IL: 2017:144-145. Model bill and regulations. In: The Association of American Feed Control Officials (AAFCO) 2017 Official Publication. Champaign, IL: 2017:139-141.